La Monserrate is a mountain in Bogota. Sitting at 3,152 metres (10,341 ft) above sea level, it overlooks the entire city. The people of Bogota believe, if a dating couple visits Monserrate, the relationship will be cursed and will not last (personally, I think that’s a brilliant fallacy spread by some priest to keep the teenagers from turning the mountain into the perfect make out lot.) And for sure there were very few couples, mostly groups and families. View form the cable car. Exercise zone…obviously what I was there for. Uh hum. I spent the whole morning and most of the afternoon up there. Half the time I sat and watched the clouds and sun weave the entire city in and out of light. Behind me, a church session had begun, bells and music filled the mountain top. Wish I had brought a pillow. Only a few seconds apart, no photos looked the same. The clouds changed swiftly and constantly. For a moment, the thunder clouds rolled in…then passed without shedding any tears. The church atop La Monserrate. Mid-afternoon the wind picked up and the temperature started to drop. It’s a sign that I should descend and find something to eat before sunset. Should not stroll around that area after dark, I was told. On the way down right before the Las Aquas station, this restaurant got my attention. I’m always inclined to visit any place that begins with “Doña.” Doña is a salutation for females to indicate respect. 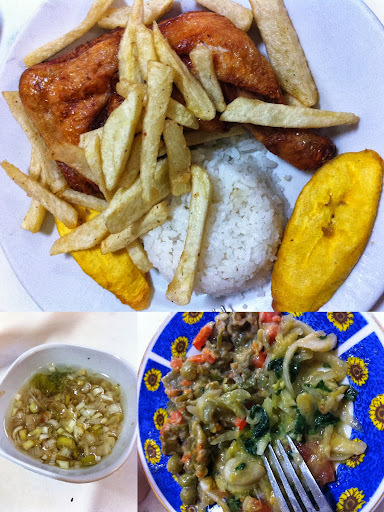 I walked into the restaurant and ordered their evening special — pollo bandeja platas. I had no idea what it was but it sounded good. As luck would have it, it was the best pan fried chicken I’ve ever had. The slightly sour and tangy salsa and warm ensalada (salad) was also to die for. After this meal, I’ve made it my mission to visit a “Doña” restaurant in each city whenever possible!